We dedicate the Thug life Neoprene Face Mask to our man Tupac Shakur. 2Pac lives! In fact, I saw 2pac drinking Hand Grenades in New Orleans wearing this Thug life Neoprene Face Mask. I thought it was odd to see a man wearing this neoprene face mask on Bourbon Street while singing "Picture Me Rolling." I walked up and asked the man if he was Tupac and he said yes. I was unable to get any sort of DNA evidence -- but his word is good enough for me. 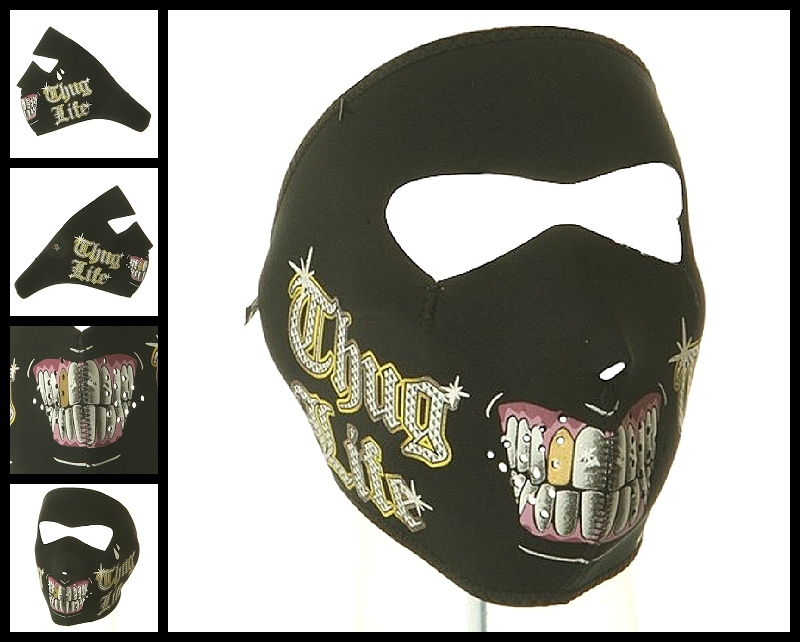 This Thug Life Neoprene face mask features full coverage of the face and ears. The stretchy neoprene material is warm and water resistant. The Thug Life pattern is reversible to solid black material. Velcro closure ensures great fit with goggles, with a helmet or without. One size fits most.